As I sat in meditation this morning, I heard car after car go by our usually quiet road. It’s the beginning of deer hunting season, my least favorite few weeks of the year. I thought of the innocent deer and sent them light. I also prayed for the hunters. As depicted in the yin-yang symbol, the seed of one side is contained in the other. I thought of how the hunters had to get up early—just like the monks—and sit in the quiet of nature during that magical hour before sunrise. 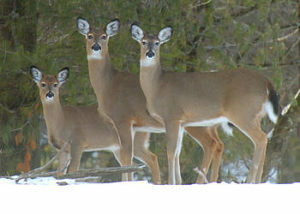 Many of them use the venison to feed their families through the winter. I knew we at Light on the Hill couldn’t do anything to change deer hunting season except to repost the land, as Larry and Justin did earlier this week, to continue offering a place for people to pray as they are doing now, and to send light to all. How similar to the election, I thought. The immigrants, people of color, the LGBT community, and the environment are like the innocent deer. We can’t change much of what’s happening in our country, but we can pray for the innocents and the leaders, protest, write letters, and continue doing the work we are called to do. Deer season passes and most of the “hill” will be peaceful once again. I know in my gut that even though things look bleak now, this administration will pass and the seed of another, more inclusive time is already present. On the positive side, this administration may get rid of dead wood in the government and cause people to become more awake. It doesn’t take away my sadness or my wish it could be otherwise, but I hold on to the knowledge of nature’s changing seasons.